With this blues course, you will develop general guitar basics and a solid foundation for playing the blues. Learn essential blues chords, scales and lead techniques like string bending, vibrato and hammer-ons, pull-offs. John teaches full blues scales with tri-tones, the B.B. Box and how to construct a 12-bar blues progression. John will challenge you to learn complete blues solos, riffs and syncopated rhythm progressions. You'll also learn the talk back effect, expansion on a main theme and how to fuse jazz into blues music. Master techniques such as rakes, pick & finger and advanced bending. He'll also show you blues endings, turnarounds, melodic blues, the circle of fourths, slide techniques and many blues rhythms. On the companion high-density DVD, students will find two full programs on one one disc as John teaches and illustrates each playing example through easy-to-follow, close-up views of each hand. He'll slowly break down all the lessons so you can easily follow along to get the hand positions correct. The included video also allows you to hear how the examples are supposed to sound and, most important, how John applies them in a musical sense. 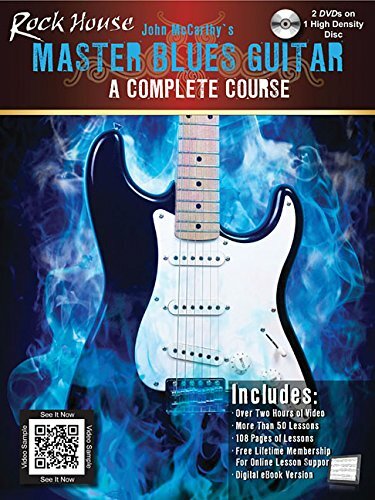 As a special bonus, each purchase of Master Blues Guitar: A Complete Course comes with a Lifetime Web Membership for Lesson Support via the Rock House Method® support system. Just enter the member number found inside the book to register for lifetime support at RockHouseMethod.com. Once registered, you can use this fully interactive Lesson Support site to download backing tracks to play the examples over, enhance your learning experience, link with instructors and connect with a community of people around the world.